Located on Baltimore's famed Inner Harbor and numerous attractions, the hotel is also within a short walking distance from Orioles Park at Camden Yards and M&T Bank Stadium, home to baseball's Baltimore Orioles and the NFL's Baltimore Ravens, respectively. The National Aquarium, the Baltimore Science Center and marina are located directly across from the hotel. Conveniently close to the Financial District, Baltimore Convention Center and 1st Mariner Arena. The staff and rooms are top notch. My guests really enjoyed their stays. As the bride I got a suite which equipped me and my 8 bridemaids enough space to get ready and the property has plenty of spots that lend themselves to take great wedding photos. It was conveniently located across the street from my venue and offered amazing views of the harbor. The bathroom mirror in the suite had a little television in it! Granted the room wasnt cheap you have to pay for parking and food which adds up. But I wouldn't have wanted to stay anywhere else. 20-Dec-2018 Verified Review, stayed from Sat Dec 15 to Mon Dec 17 2018 at a $139.00 group rate (26% discount). 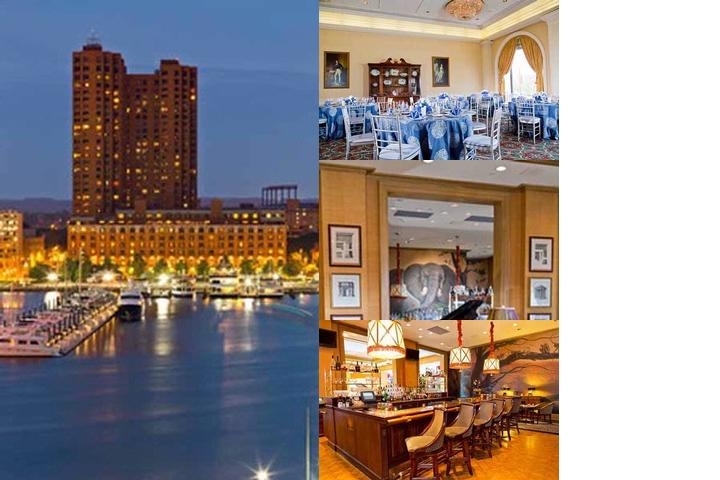 Luxurious classic 203-room property with European decor, upgraded amenities, and premier location on Baltimore's Inner Harbor. Rooms are oversized and feature pillow top mattresses, Egyptian Cotton sheeting and duvet, bathrobes for each guest. Business Center, on-site parking and personalized concierge services. With 10 exquisite event rooms totaling 10,125 square feet, groups may be accommodated up to 200. Personalized Service abounds! Property is ranekd in the top 5 on Trip Advisor within the entire Baltimore area market. Individual reservations must be canceled by no later than 4:00 pm local hotel time the day prior to scheduled arrival. 9.8 miles from the Baltimore Washington International Airport (BWI) Shuttle Service is available from the airport for $16.00 or $25.00 round trip - 1-800-BLUE-VAN. Or Taxi Cab one way costs approximately $35.00. Explorer's: Full menu available, and buffet offered most weekends (Sat & Sun mornings). Typical cost: Full American breakfast $16.50, buffet $19.95Formula Espresso: Lobby level coffee shop features bagels, pastries, coffees, juices. Free Wi-Fi in all guestrooms supports up to six devices. Join the free Sonesta Travel Pass loyalty program and receive upgraded Wi-Fi with faster download and upload speeds and service for up to 10 devices per guestroom. The Sonesta highlights above are subject to change without notice. 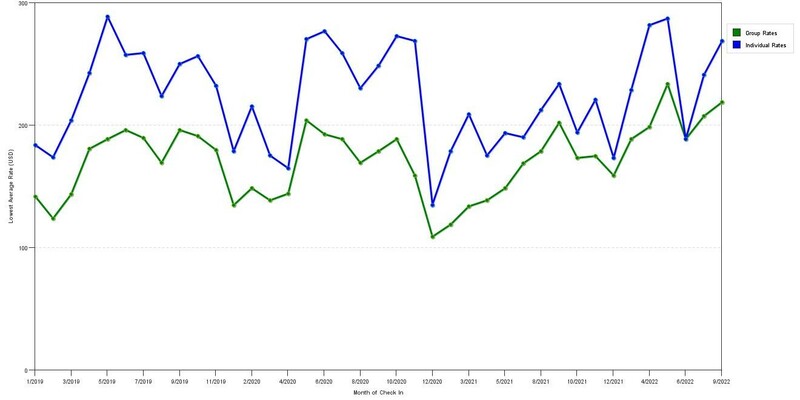 The chart above shows fluctuations of prices for both group/meeting prices and the best individual traveler prices our rate checker could find at the time the group/meeting offer was submitted. The most competitive group discount displayed is 41.9% in the month of May 2017 and the highest average individual rate is $331 in the month of July 2017. This chart will show past seasonality and also project future months. If you are flexible with dates, you may want to consider staying at Royal Sonesta Harbor Court in a month when rates are lower. Below are the meeting, banquet, conference and event spaces at Royal Sonesta Harbor Court. Feel free to use the Royal Sonesta Harbor Court meeting space capacities chart below to help in your event planning. Hotel Planner specializes in Baltimore event planning for sleeping rooms and meeting space for corporate events, weddings, parties, conventions, negotiated rates and trade shows. 16 x 24 x 12 Ft.
16 x 21 x 12 Ft.
29 x 15 x 14 Ft.
28 x 51 x 16 Ft.
49 x 35 x 16 Ft.
30 x 12 x 12 Ft.
32 x 24 x 12 Ft.
43 x 35 x 16 Ft.
35 x 36 x 16 Ft.
31 x 35 x 16 Ft.
29 x 43 x 12 Ft.
74 x 35 x 16 Ft.